I love a good night's sleep, as I think most people do. Sadly I don't always find that I can get that sleep due to my body being sore and my mind being restless. Lucky for me Dr. Teal's makes a great Epsom Salt soak in Lavender called Soothe & Sleep. It really is just what I need. I work a physical job and often have sore, swollen or tender feet at the end of the day. I also have some lower back pain, early arthritis in my knee (super unfun to learn in your 30's by the way) and a torn rotator cuff. If this wasn't enough, I also suffer from some general anxiety, which can make falling asleep a little difficult. While I go to a physiotherapist for these issues, on a day to day bases I need something more to help me soothe the pain and frankly relax. 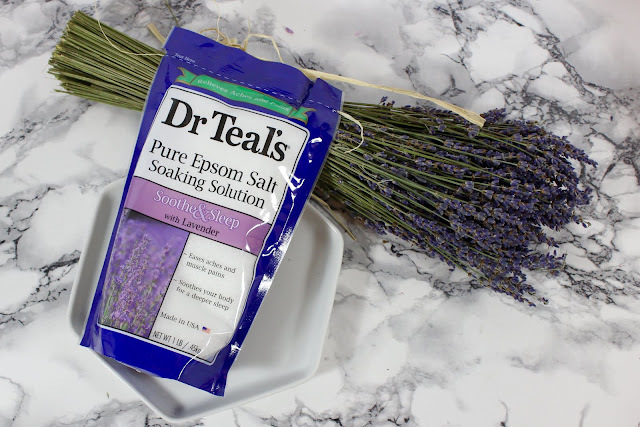 Dr. Teal's Pure Epsom Salt Soak with Lavender (Soothe & Sleep), takes my night time bath that I love so much and makes them actually therapeutic for me. 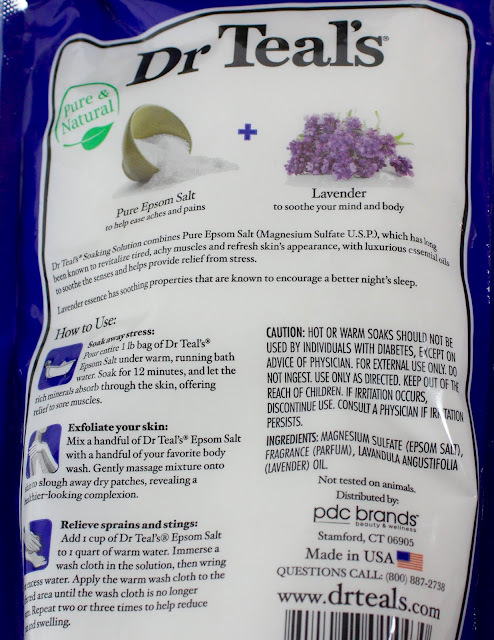 The Epsom salt helps relax my muscles and help relieve some pain, while the lavender helps my mind relax and unwind. 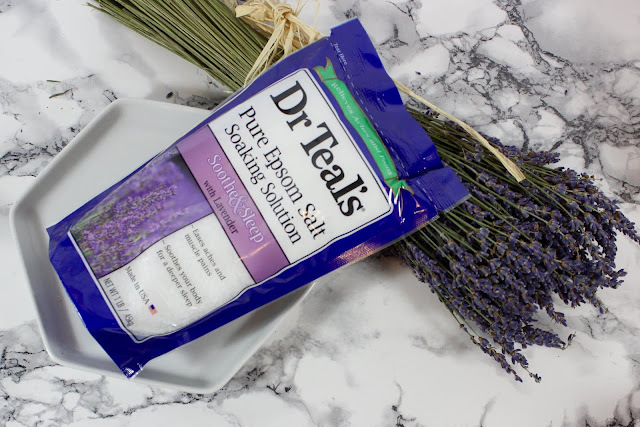 The bag also gives a few more ways to use the salts that can help. Soak Away Stress, put the entire bag under warm running water and soak in it for 12 minutes. Exfoliate Your Skin, mix a handful of salt with your body wash and massage onto skin to slough away dry patches for smoother skin. Relive Sprains and Stings, add 1 cup of salts to 1 quart of warm water. Immerse a washcloth in the mixture, wring out excess water. Apply the warm washcloth to the area until the cloth is no longer warm. Repeat two or three times until help reduces swelling. Ok, so I think these ideas and methods sound great, I honestly just like to just soak in a bath with a few handfuls of the salts added to it. I find the smell quite strong and a little goes a long way. Which honestly might be the best part for me, I don't need to use the whole bag to get a very strong lavender scented bathroom. I also like to make a foot soak out of it. I add a cup of the salt to some warm water and soak my feet in it. I just picked up a dishwashing bin at a dollar store and use it as a makeshift foot bathtub. It works great and my feet always feel amazing afterwards. You could even make that exfoliating paste and use that on your feet first. I definitely have been more relaxed at night since I started using Soothe & Sleep in my baths and less ache at bedtime, which in turn has made my sleep more restful and me less restless. I would definitely recommend Dr. Teal's Soothe & Sleep Pure Epsom Salt Soak in Lavender to anyone who likes lavender, like a more relaxing sleep or has aches and pains at night. 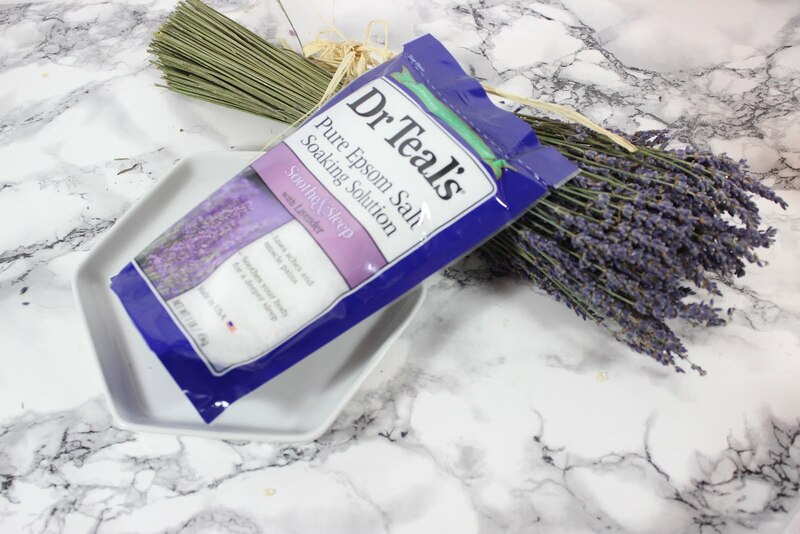 You can pick up Dr. Teal's at most drug stores, Superstores and Walmarts in Canada. Do you have tips to help have a better night's sleep?